This product has been discontinued. For these minerals we now offer Schindelle's Mineralien, please click here for full details. Customers using this supplement primarily for the Boron content are advised to use Arthro-Care now, please click here for full details. Many customers wanted the Colloidal Minerals, but had no particular need of the Boron content, which drove the product price up considerably. Therefore we have sourced the same minerals but without the Boron with a saving of £0.25 daily (£7.50 per month), and vice-versa, many people wanted the Boron content specifically. For these customers Arthro Care contains a slightly higher Boron level (9mg vs. 8.4mg) and in a more beneficial form and is £0.12 less expensive per day (£3.60 per month savings) it also contains more than 1g of Seagreens per daily dose. 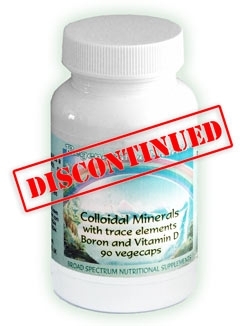 For those who wanted both the Colloidal Minerals and the Boron, as per the original product, the 2 products detailed above can be combined for a perfect replacement that goes beyond the specification of the original, and will especially benefit from the added seagreens.